In the American Revolution, Virginians were the most eloquent spokesmen for freedom and quality. George Washington led the Americans in battle against British oppression. Thomas Jefferson led them in declaring independence. Virginians drafted not only the Declaration but also the Constitution and the Bill of Rights; they were elected to the presidency of the United States under that Constitution for thirty-two of the first thirty-six years of its existence. They were all slaveholders. In the new preface Edmund S. Morgan writes: "Human relations among us still suffer from the former enslavement of a large portion of our predecessors. The freedom of the free, the growth of freedom experienced in the American Revolution depended more than we like to admit on the enslavement of more than 20 percent of us at that time. How republican freedom came to be supported, at least in large part, by its opposite, slavery, is the subject of this book. 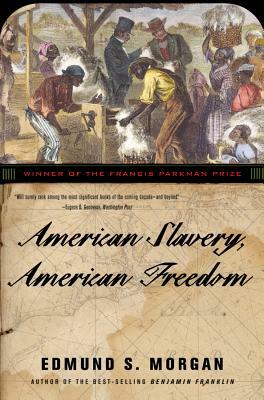 American Slavery, American Freedom is a study of the tragic contradiction at the core of America. Morgan finds the keys to this central paradox, "the marriage of slavery and freedom," in the people and the politics of the state that was both the birthplace of the Revolution and the largest slaveholding state in the country.